As the mom and head cook of my household, there are little food sacrifices that I make all the time. I constantly DON'T cook things that only I like to eat, like Pasta Puttanesca (caper and olive phobes in the house), Scalloped Oysters (now that my mother-in-law is no longer with us, I'm the only one that likes that Thanksgiving favorite), Pasta with Anchovies (don't get my husband started on defaming them as hairy, stinky eyebrows), Beets? Fuhgettaboutit. And I only buy those delectable little jars of pickled herring for parties when my buddy Lisa, she of Finnish extraction, is going to be around to nibble with me. I figure it's not frugal or fair to make up up a whole pot of something that only I am going to enjoy. But I ask you, dear readers, is it wrong to occasionally cook up something I crave from my pre-finicky family days? No, I say! Everything in moderation, as my wise Grandma used to say. There must be payback for all those sleepless nights walking my ear-achey babies around and being the only one that can find things in the refrigerator for my appliance-challenged husband. (there's a finite amount of space in the fridge, so I don't know why he can't find stuff). And so I splurged on a rutabaga. A little one, comparatively. About 1.5 lbs. Rutabagas can be much larger, but I picked up this very cute purple-topped beauty, gleaming in its skin of wax. The wax keeps the 'baga from wilting away during storage. It's a member of the Brassica family, closely related to the whiter, smaller turnip, but with a mellower flavor. Once stripped of its skin, the flesh is a pale golden color that deepens into a yellowy-orange when cooked. My grandma, she of the moderation exhortation above, would make mashed rutabaga for holiday meals and she and I always partook of it, but my nuclear family will have none of it, so I chomp it down myself and subsequently only buy a rutabaga every few years. I think it is very earthy and tasty, steamed in chunks until tender and then mashed with salt, pepper and butter. 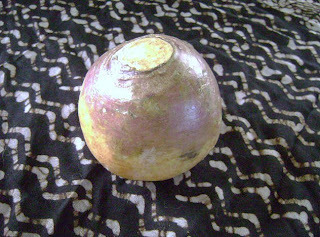 It is a great source of fiber and Vitamins A and C.
International Rutabaga Curl, an annual end-of-the-season Ithaca Farmers Market event. The vegetable has even inspired a fabulous Handel-inspired Rutabaga Chorus. So I cooked up my rutabaga and then decided to try a recipe for a Rutabaga Souffle from my shoebox card file. I don't know where I got the original recipe, but I halved it and tweaked it a bit and the result was so good that I was even able to tempt Mr. Crispy into trying it on his dinner plate. He said it was better than eating it plain mashed, so while he might not be a Rutabaga Convert, I think I might step up to buy a rutabaga each year! Lightly grease a small casserole dish with softened butter, reserving remaining butter for rutabagas. Place rutabaga chunks in a small pot with water to cover. Bring to a boil. Turn heat to low, cover and simmer until rutabaga is fork-tender (about 15-20 minutes). Drain. Mash rutabaga with softened butter and try to get most of the lumps out. Add onion powder and salt and pepper to taste. Beat in egg yolks. Beat egg whites in separate bowl until stiff. Fold in gently but thoroughly into rutabaga mixture. Turn into buttered casserole dish and bake in a 325 degree F oven for 45-50 minutes. Sprinkle souffle with grated cheese and bake another 5 minutes until cheese is melted. Rachel, I love, love, love rutabaga and make it every Thanksgiving. I peel it, slice it about 1 inch, pour over melted butter, salt, and pepper and wrap it in foil and bake until tender. I rough mash it and add a bit of nutmeg. It's wonderful, but your souffle-like rutabaga has got to be incredible and I will be making it soon. I like swede, so it is hard to understand the haters! I've never seen them waxed before though - and they keep for ages even without it. I love neeps! (as a Scot, it is part of our national dish - Haggis, neeps and tatties) When I moved to England I had to learn to call it swede, but whatever you call it it's a great veg. I love it mashed with carrots, with lots of butter. I LOVE rutabaga and this souffle looks so delicious! A nice step up from mashed but with all that nice sweet rutabaga flavor. So true I have yet to cook rutabaga but I must rectify that and your dish sounds like the perfect way! 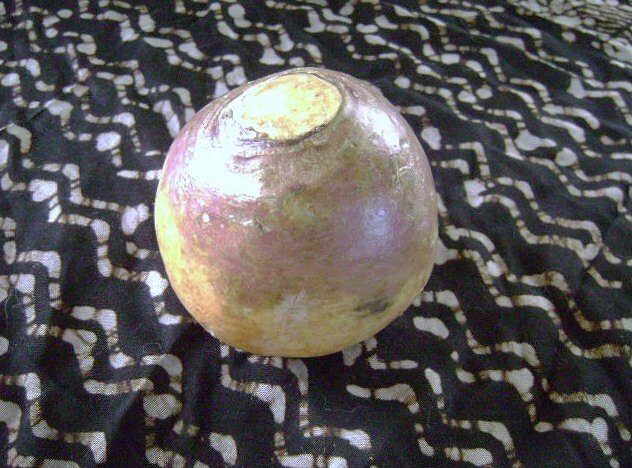 Glad to see so many other rutabaga/neep/turnip/Swede lovers out there! Rutabaga, rutabaga, root, root, root! I'd like to hear that chorus! My husband loves rutabagas, but we can rarely find them here. If I do happen on one though, we'll give your recipe a try. It sounds so good. rutabaga? it's a turnip! fame mash of haggis time. yuk vegetarian haggis and peas for me. But.... my relatives in a fishing town in SE Scotland call it Baigie. Now I understand. Language is so fascinating.